It’s time to accept it – charades, Monopoly and Trivial Pursuit just won’t cut it at Christmas any more. We’re a nation of gamers now – glued to our smartphones and our controllers, and the festive season is one of the few times in our hectic lives where we get to indulge that digital itch. This year has already been a vintage for gaming, but with the Christmas nearly upon us, some of the biggest titles of the year are yet to be released, making for some hotly-anticipated games perfect for wrapping under the Christmas tree. Whether you’re after the colourful playfulness of a Mario game for your kids Nintendo Switch, or a gritty shooter for your other half’s PlayStation 4, TechRadar's Gerald Lynch has picked out the best of the best for all gamers below. The one that any gamer worth their salt has been waiting for. Eight years since Grand Theft Auto developers Rockstar set their open world expertise loose on the Wild West, we’re returning to the age of gunslingers with Red Dead Redemption 2. Set to be one of the most ambitious and spectacular games ever met, you’ll be able to go anywhere and do anything as the outlaw Arthur Morgan. Recruit a posse, hold up banks, have a bar room brawl and ride off into the sunset on your trusty steed – if there’s a cowboy cliche you’ve ever wanted to play out, Rockstar’s spaghetti Western-turned-video game will make your day. There have been Spider-Man games over the years, but none as ambitious as this PS4 exclusive from developers Insomniac. It’s a visual marvel (geddit? ), putting the entirety of Manhattan just a webswing away. With the full rogues' gallery of villains to battle, plenty of secrets to collect and a superb swinging system that really makes you feel like Ol’ Spidey, it’s a comic book fan's dream game. Ever wanted to captain your own pirate ship? How about doing so with a crew made up of your own pals? 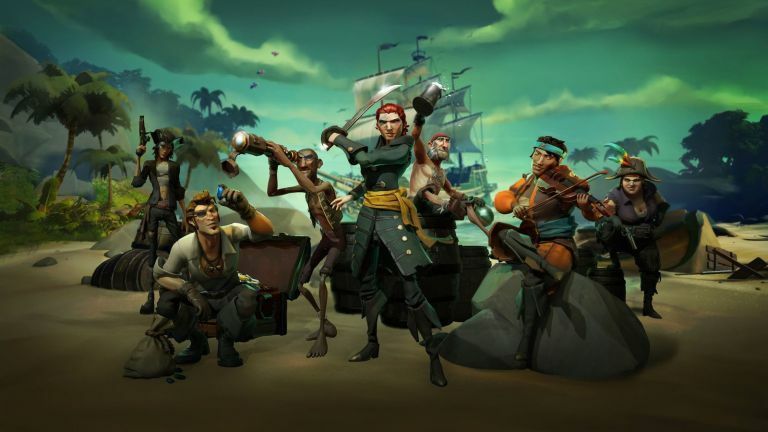 The cartoony fun of Sea of Thieves allows you to do just that, setting sail across the seven seas on a galleon manned by your friends, seeking out buried treasure and sword fighting against skeleton buccaneers. Also available on PC. Nintendo’s bashful brawler is back, pitting the likes of Mario, Luigi, Donkey Kong and Link against other members of the gaming elite. Madcap punch-ups full of magical items and trap-laden levels, there are few better multi-player games than Super Smash Bros, with Ultimate being tipped as the most complete games in the series to date. Super Smash Bros Ultimate is released date: December 7 2018. The Elder Scrolls and Fallout games have always been gigantic solo adventures, but the post-apocalyptic franchise is walking new irradiated roads this winter as it opens the wasteland to teams of travellers instead. Taking the large scale role-playing action of the earlier first person shooters in the series, and throwing your pals into the mix, you’ll be able to quest and fight off the mutant hordes as a team. Also available on PS4 and Xbox One. Can you believe it’s been 25 years since the first ever PlayStation was released? Whether you’re a fresh-faced Fortnite or an old school Tekken die-hard, there’s lots to love about the new Sony PlayStation Classic Console – a palm-sized PS1 pre-loaded with 20 classic games. It's 45 per cent smaller than the original PlayStation and, complete with two controllers, you’ll be taking a trip down memory lane with the likes of Final Fantasy VII, Tekken 3 and Ridge Racer Type 4 come Christmas morning. PlayStation Classic Console released date: December 3 2018. There’s more to being a gamer than just the consoles and the games themselves these days. To get the full experience, whether that be online multiplayer with Xbox Live and PlayStation Plus, or a ready made library of games to download or stream with Xbox Game Pass or PlayStation Now, subscription services underlie a lot of what the modern gamers sinks their cash into. That’s before you start considering entertainment services like Spotify and Netflix, all of which are available on consoles these days too. Pick up one of these essentials to make a gamer’s Christmas complete. Need a screen as big as the epic games your loved ones will be playing? The Mars II portable projector from Anker is the perfect accompaniment for an epic quest, projecting a HD-ready picture up to 150-inches in size anywhere you like thanks to its built-in four hour battery life. While it’s not best suited for 4K gaming, it’s a great match for the new wave of retro mini consoles, like the PlayStation Classic above, and last year’s Super Nintendo Mini. It’s also got Android built in, meaning you can stream from movie services like Netflix and Amazon Prime just from the projector itself.